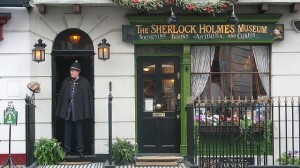 How do we get to the Sherlock Holmes Museum? Step back in time to Victorian London and visit the home of Sherlock Holmes and Dr Watson at 221B Baker Street. Underground train: Take the Bakerloo line tube (brown colour) from Kensal Green to Baker Street. Journey time is about 16 minutes. Bus: Take the no.18 bus at the Victor Road stop for a 25-minute ride to Baker Street station. The bus runs every 3-4 minutes on weekdays and every 7-8 minutes at weekends.